This volume traces transformations in attitudes toward, ideas about, and experiences of religion and the senses in the medieval and early modern period. Broad in temporal and geographical scope, it challenges traditional notions of periodisation, highlighting continuities as well as change. Rather than focusing on individual senses, the volume’s organisation emphasises the multisensoriality and embodied nature of religious practices and experiences, refusing easy distinctions between asceticism and excess. The senses were not passive, but rather active and reactive, res-ponding to and initiating change. As the contributions in this collection demonstrate, in the pre-modern era, sensing the sacred was a complex, vexed, and constantly evolving process, shaped by individuals, environment, and religious change. 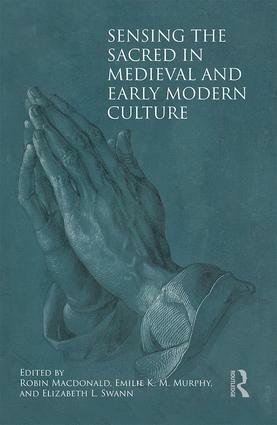 The volume will be essential reading not only for scholars of religion and the senses, but for anyone interested in histories of medieval and early modern bodies, material culture, affects, and affect theory. Robin Macdonald completed her PhD at the University of York and was a Postdoctoral Research Fellow at the ARC Centre of Excellence for the History of Emotions at the University of Western Australia. Emilie K. M. Murphy is a Lecturer in Early Modern History at the University of York. Elizabeth L. Swann is a Research Associate at the University of Cambridge. From September 2018, she will be Assistant Professor in Interdisciplinary Studies within the Department of English Studies, Durham University.